It’s a statement that could far more easily be applied to folk and old-time music. It’s true that classical music in movies is rarely sympathetic to the art form – “alleged geniuses compose NFL highlights music” writes Ross. In the folk world, however, schlock never creates any sympathies, misplaced or otherwise. The banjo in Deliverance will be remembered long after the movie is forgotten. People these days see a bumper sticker that says “paddle faster, I hear banjos” and wink, though it’s hard to imagine that all of them have really seen the movie. The joke is so evergreen that the punchline lives in the absence of its antecedent. As wonderful/fun as “A Mighty Wind” is, the joke that folk music fans enjoy is two-dimensional in the eyes of everyone else. None of the schlock creates any sense of reverence. Ever. At the heart of the matter, though, is the division between rural and urban sensibilities that reinforces those kinds of stereotypes. Classical music, despite Ross’ concerns, is reflexively thought of as enriching, skilled, and worthwhile, much like medicine is. You might not like it, but it’s good for you, the popular thinking goes. Even those who might say they hate classical music tend to consider it as a high form of art – just as rocket science and Einstein connote genius, an appreciation of classical music connotes an appreciation of culture. Old time music, when used in films at any rate, is used to connote the opposite, and when a filmmaker is feeling extra punchy, it’s coupled with its visual component: traditional dance. George Clooney did it in O Brother Where Art Thou. His character was an amiable dimwit, and the dancing and the fake beard confirmed it. There, and elsewhere in the world of corrosive clichés, I’d venture that traditional dance suffers more than anything. Al Jolson has a better reputation, and we’re reminded that he was a cantor more readily that we are the fact that he made a living of, well, singing in blackface. The thing is, they’re wrong about all of it, which is something that Jamieson deftly, and refreshingly, points out in his book. The approach to rural dance, truly, is about us. It’s about the prejudices that, even today, urban culture projects onto rural life. “Duck Dynasty,” “Farm Kings,” etc., are the contemporary equivalents of Ashe’s commentary, Hee Haw, and Deliverance. Urban audiences, then as now, love to look down on rural life, believing that it’s simple and easily understood. Rightly, Jamison discusses all that at the front of the book, getting it out of way, as he is more interested in the art form itself than he is the perceptions of it. I say rightly, because it is interesting, more than I suspect anyone knows. Jamison demonstrates how the history of dance is the story of America: immigration, race, trade, culture, identity, fashion, social stratification, and innovation. The closer you look, the more fascinating it all becomes. 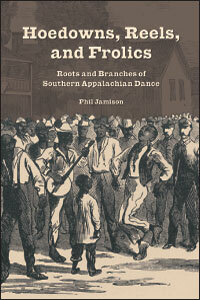 There are some great tidbits in here – one reason that jigs in 6/8 time aren’t found in the Southern fiddle repertoire, unlike reels in 4/4, is because it’s a difficult time to play on the banjo – though it’s the progress of dance and music, and what it says about us as a culture today, that animates the book. Culture is never static, as much as we might think it is. And, indeed, that’s just the beginning. This book is about dance, true, but it also provides an analogue for so many other things, reminding us, once again, that few forms of art – perhaps even classical music among them – are ever quite what they seem.